What storm? The Extravaganza indoors at Sportspark. A nor'easter temporarily closed flooded Southpoint and Lighthouse Park. 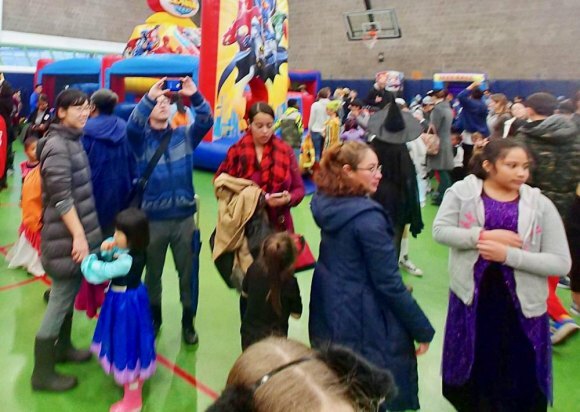 Rising tides on the East River stopped traffic on the FDR, but the Halloween spirit won out at RIOC's Extravaganza in Sportspark. 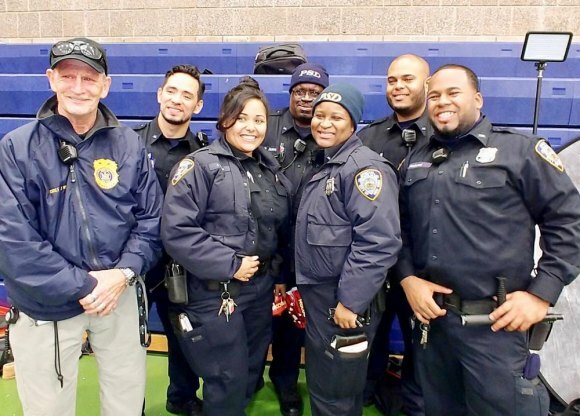 When forecasters projected a powerful storm arriving just in time to spoil Roosevelt Island's annual Halloween Parade, RIOC reacted quickly, canceling a parade doomed by bad weather and moving festivities indoors to Sportspark. Forecasts proved to be on the money, and so did RIOC's planning for an alternative. Notifying us that Southpoint and Lighthouse Park were closed, Public Safety Department chief Jack McManus added, "Big crowd at Sportspark, though." Parks secured, PSD Chief McManus and crew came to the party. Kids and grownups alike got to show off creative costumes while chasing food, fun and games, winds and drenching showers outside notwithstanding. The scene in Lighthouse Park at mid-afternoon, while the party raged on. Video courtesy of RIOC PSD.